He is evil incarnate. A fallen angel that feeds off the souls of others. Everything Nesy is supposed to hate. But she can’t, because he’s also the human love of her former life as a teen; a life that ended too soon, tying her to emotions she should never feel. As if casting out demons isn’t hard enough, five-hundred-year-old Nesy has to masquerade as a teenage girl to do it. 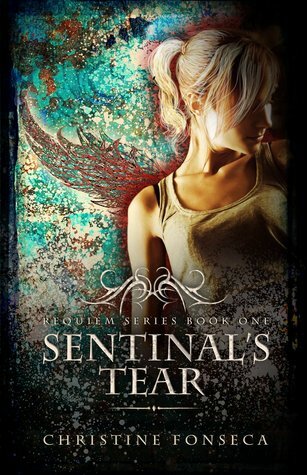 Nesy is the best of an elite group of angels – warriors called Sentinals – charged with the job of vanquishing the fallen. She’s never made a mistake, never gotten emotionally involved. But when she comes face-to-face with Aydan, she freezes. Now she must choose between doing her duty – damning Aydan to the fiery depths of hell – or saving him, and condemning herself. I shift in the booth, careful to remain hidden in the shadows. My human form feels foreign, awkward. Nothing about tonight’s assignment seems right; not the constant thoughts echoing through my mind nor the everpresent feelings I can’t seem to shake. I tighten the muscles across my back, desperate to escape the confinement that comes with this new body. One I never wanted. My senses register each scent, each sound, adding to the noise of too much mental chatter already ricocheting in my head. Sweat and too-strong perfume from the tangled mix of bodies on the dance floor burn my nostrils. My heart pounds against my ribs and unfamiliar twinges of fear cloud my vision. Feelings I can’t decipher crawl through my skin, sending chills throughout my body. I may have prepared for this task, but nothing could prepare me for being a seventeen-year-old girl. I slip further into the booth, surveying the scene. Lights pulse around me, synchronized to the blaring sounds that pound from the speakers. Clubbers sway to the music in intoxicating rhythms, casting a spell throughout the room. And somewhere in the crowd lurks the one I came for—the UnHoly. I narrow my eyes, taking in the irony of the church-turned-nightclub. Tall, gothic arches adorn the ceiling. Old stone sculptures of saints and angels watch the hordes of teens gyrating on the dance floor. The altar, once a sanctuary, now houses a stage where up-and-coming bands woo adoring fans. The remaining spaces are punctuated with small alcoves designed to hide the club’s true patrons: dark creatures that feed on the lust and fear of the human crowd. My task is simple enough: find the UnHoly and vanquish him to the Abyss. Just like the countless other assignments I’ve had over the past few centuries. But something about this task feels wrong. Something that sends fresh shivers cascading down my very human spine. Little information was given to me about my target, only his name, location, and human age. I’d have to figure out the rest. No problem, since vanquishing the UnHoly is my specialty; whether I’m stuck in a teenage body or not. Two: Lure him away from the crowd. Don’t want to ruin my perfect record with collateral damage. Satisfied, I settle my thoughts and prepare for battle. The sooner this is finished, the sooner I can ditch this body and escape the chaos it brings. My human form may look similar to my angelic being, with its familiar blond hair and blue eyes. But I hate being trapped in this flesh, stifled by the heaviness of this body. I miss feeling the air move through my wings and play across my skin. More than anything else, I miss the quiet solitude of my mind; no emotions to muddle my thinking, no angst to cloud my judgment. Necessary or not, I’m never masquerading as a teenager again. I smooth out my clothes—black leather skirt, black tee, leather jacket and boots that stretch up my long legs—and approach the altar-turned-stage. The would-be guard swallows hard. His gaze rakes over every inch of me as his lips part slightly. He swallows hard and smirks. Oh yeah, he’s easy. “So? Is he?” I purr. “Oh, I’m sure he’ll find you. You’re just his type,” the guard says. The lights dim and I take my position in front of the stage. Four dark shapes emerge from the shadows. The band. I scan each one as the crowd fills in behind me. Heavy sounds from the bass guitar and drums send the horde into a frenzy. I move with the crowd and continue to search. Which one is he? The drummer? Nope, he’s definitely human. The guitarist? Maybe. He’s too dark to be fully mortal. Too demonic. But he’s also far too weak to be the UnHoly. I scrutinize the rest of the group. He has to be here. I couldn’t have made a mistake. I don’t make mistakes. Not ever. A single spotlight focuses on the lean silhouette of the lead singer; a teenage boy who’s definitely more than human. He’s taller than I expected, wearing clothes that match my own—black jeans, a black sleeveless shirt open just enough to see his smooth pale skin, and black boots. His chiseled muscles and dye-job-black hair hanging in an unruly mess add to his allure. But it’s his eyes that draw my attention. Amber with flecks of gold. I bite my lip, my mind racing. Aydan, the only apprentice to the Dark One. Feared by angel and demon alike. He’s rumored to stop at nothing to procure anything and everything his master wants. Judging by the way he hypnotizes the crowd of unsuspecting teens with his voice and eyes, I have no doubt that the rumors are well-earned. More than dangerous, Aydan is lethal. I check out the club, looking for the best way to lure him outside. He’s managed to elude capture for more than four centuries. Clearly he knows how to avoid the likes of the Sentinals, the likes of me. But not tonight. Not with this body. I focus my attention back on him as he finishes his song. There is no evidence of his true nature reflecting in his features; no fangs or claws to signal danger. No sulfur-scent or bloodlust. No proof of the evil that lurks just under the surface. Nothing except the black bat-like wings curving across his back, hidden from everyone. Well, almost everyone. Not expecting me, are you? His voice intoxicates the crowd. The hunger in his eyes reveals his true intent. Aydan is on the hunt. I notice a small door at the end of a corridor adjacent to the stage. No doubt it empties to the alley that flanks the church. Perfect. Now, to get him outside before he chooses one of the screaming girls as his prey. Aydan finishes his song as I make my way around the stage and toward the hall. I watch as he turns away from the crowd. The horde screams for him and begs the band to continue. Aydan grabs the mic. “Do you want more?” he yells. Their response, a cacophony of “Yes!” and “We love you, Aydan!” rings through the rafters of the once-holy building. I watch as he works the mob into a craze. Voices blend away. The scene shifts. All I see, all I hear, is Aydan. An unfamiliar current of electricity streaks through my body, causing my heart to beat wildly against my ribs. The tiny hairs on the back of my neck stiffen with anticipation while anxiety fills my senses. I force my heart to slow and shove aside the silly human reactions. The guitarist starts to strum a ballad. A light frames Aydan as he begins to sing in slow, rhythmic phrases. He scans the crowd, a predator looking for his prey. Time stops and he turns to me. Our eyes lock. A smile pulls at his lips. My skin erupts in gooseflesh. My legs begin to wobble. His smile broadens and for a brief moment I forget how to breathe. Strange sensations inundate my thoughts. My abdomen clenches and my body trembles. His stupid mind tricks are working. On me. The crowd is wild tonight, hordes of kids desperate for a little action. The perfect hunting grounds. Maybe that’s why I stick with the band—the free food. My senses pick up the distinct scent of vanilla and warm sugar. My favorite. I feel the craving start at the back of my throat. I have to find the source of that scent and drink from her soul. The lights drop as I sing a slow melody. The rhythms are smooth, seductive. I watch the girls drop their defenses and feel their desire rise. Scanning the crowd, I search. My need grows as the seconds pass. Every girl strains to look at me and through their eyes I see their need, taste their lust. It floods my senses, nourishing me. But the feeling is temporary, just enough to awaken the Beast within and force me to continue the hunt. My eyes settle on a girl near the back of the crowd, sandwiched between the stage and a narrow hallway. She’s different from the usual patrons of the club. Beautiful—long blond hair, legs that seem to stretch forever, and curves that make me ache. But it isn’t her beauty calling to me, or her distinctive vanilla scent. Her desire fills me. Not only desire, something more. Something angry and dangerous. Something that awakens the core of my being. I stare into her eyes and ride her emotions as they crest. I sing my lyrics only to her. Our worlds collide; nothing exists but the two of us. She closes her eyes, obviously trying to break the spell I’ve cast. But I know it won’t work. No one can get away from me. I’ve had centuries of practice. I continue to sing, weaving a trap around my target. She stares at me, an almost pained expression etched into her features. A flood of emotions fills me, chaotic and wild, desperate. Her feelings, her passion. The taste is addictive and I know I can’t resist her. I don’t want to. The song ends as my frenzy grows.